Pilates is beneficial for men and women, young and old, athletic, sedentary, or in physical therapy. It is a system of body conditioning that is both gentle and athletic, known for it’s “feel good” and body transforming results, which will help you in everyday life. Regular Pilates sessions will bring you improved posture, strengthened and toned muscles without added bulk, flexibility and muscle control, alignment and coordination, increased lung capacity, improved body awareness and many other functional results. 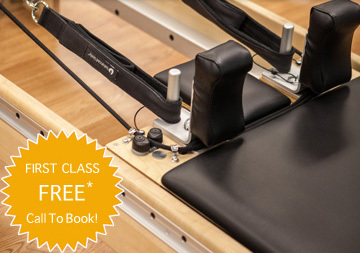 you focus on the detailed movements of Pilates, in the peaceful setting of our studio. 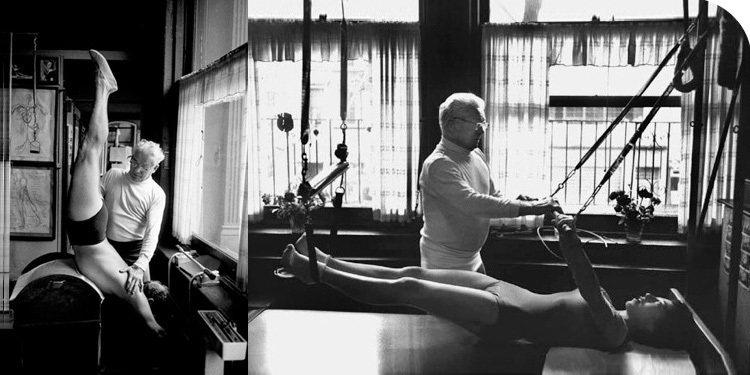 Joseph Pilates' New York studio put him in close proximity to a number of dance studios, which led to his “discovery” by the dance community. Many dancers and well-known persons of New York depended on Pilates method training for the strength and grace it developed in the practitioner, as well as for its rehabilitative effects. Until exercise science caught up with the Pilates exercise principles in the 1980s and the surge of interest in Pilates that we have today got underway, it was chiefly dancers and elite athletes who kept Joseph Pilates' work alive. Power. Pilates maximizes performance and builds power by developing a strong foundation of core stability that allows the primary movers and levers to work on explosive movements more efficiently. The Jumpboard, an attachment to the spring-resistant Reformer, is an excellent tool that allows for supine and sidelying plyometric training. By eliminating gravity, Jumpboard teaches correct biomechanics during take off and landing and is particularly effective in rehabilitation, as it provides athletes with a partial weight-bearing workout that activates fast-twitch muscle fibers. Mind-Body Control. Pilates teaches participants to be mindful in their movements by integrating the pelvis, trunk and shoulder girdle in a safe, challenging and progressive system. The method facilitates neuromuscular re-education to occur in functional positions and multiple planes with focus on spinal stabilization. Dynamic activity in supine, prone, sitting, kneeling, quadruped, and standing postures requires balance and coordinated motor control. Concentration and the mind-body connection are essential components of this method and is typically what makes stellar athletes stand out from good ones. A recent study revealed that the Pilates method of exercise may contribute to improved performance in double leg lowering, star excursion balance tests, and throwing speed in college baseball pitchers. Stamina. Research has revealed that active middle aged men who participated in two 60-minutes Pilates sessions per week for 12 weeks demonstrated statistically significant increases in abdominal and upper-body muscular endurance. Exercising on the apparatus also promotes endurance, as requires consistent co-contraction to concentrically resist and eccentrically control the spring tension. Circulation. The emphasis on coordinating breathing with Pilates repertoire enhances blood flow to the soft tissue and reduces stress, reducing hypertension and Valsalva. The Jumpboard can also be used as a method of cardiovascular training. Mobility. The greatest fear of men when doing pilates is flexibility. The benefit of this method is that it promotes functional mobility with a stable center. Experienced teachers will also know several ways to modify for impaired segmental mobility or muscle length in the hip girdle and gradually progress the man safely. At Fusion Fitness, we are dedicated to providing our clients with the leading fitness technology in Pilates and Personal training in a friendly atmosphere. Our trainers are focused in motivating and inspiring every individual to achieve their personal best. 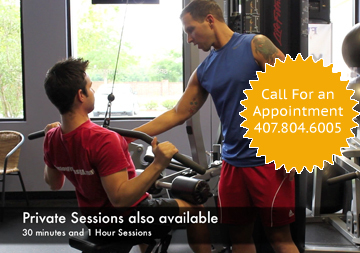 While Fusion Fitness offers many paths to inspire and motivate, our mission is to be your total fitness solution. Our world-class studio features the latest top-of-the-line fitness technology, from Cadillac and Reformer apparatus for Pilates exercises to resistance machines and free weights for personal training. 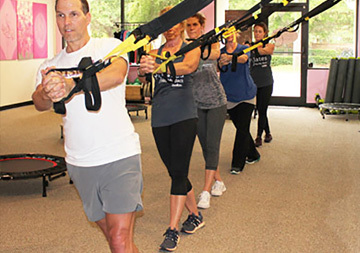 We Also provide TRX and Pilates Bar Classes (Beyond Bar). Fusion Fitness also plays a big part in our community. We try to give back the healthy way with free workshops and weekly fitness events.